The development of lightweight sophisticated diving equipment since World War II (from 1939 to 1945) has made underwater archaeology a flourishing branch of archaeology. The science of underwater archaeology involves the recovery and study of submerged archaeological finds and sites, including ancient springs and wells, lakeside settlements, and marine sites such as sunken cities, harbors, and shipwrecks. Underwater surveys and excavations of, for example, sunken ships and their cargo provide enormous information about ancient societies. Sunken artifacts are often well preserved, protected by layers of silt in a stable environment of salt or fresh water. As a result, underwater archaeological finds and sites provide particularly valuable insights into ancient times, since they constitute "time capsules" of brief historical moments. In the early nineteenth century, English divers made a living by searching the waters around Portsmouth for shipwrecks. These early underwater explorations were accomplished using primitive diving bells, suits, and helmets. Some of the earliest scientific underwater investigations occurred during the middle nineteenth century in Switzerland. Recently, wooden house posts were exposed when the water level of Lake Geneva was extremely low. Excavations revealed the remains of a Neolithic (latter part of the Stone Age) lakeside settlement that had been submerged by the rising water level of the lake. The prehistoric remains confirmed the succession of the three archaeological ages: Stone, Bronze, and Iron. 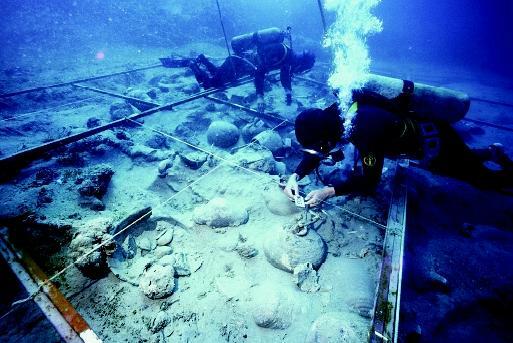 In a comprehensive underwater archaeological project from 1983 to 1994, a team led by American archaeologist George Bass and Turkish archaeologist Cemal Pulak recovered a heavy cargo of a Bronze Age ship at Uluburun, off the southern coast of Turkey. The ship that was wrecked in a storm c. 1310 B.C.E. carried enough tin and copper ingots to forge military weapons for several hundred people. The earliest breakthroughs in underwater archaeology techniques were made in the Mediterranean, where pioneers like George Bass showed the potential of the technique by scientifically excavating ancient and morerecent ships. These breakthroughs are now standard procedures all over the world and in all climates. 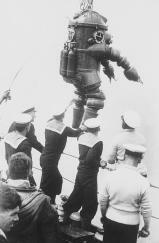 Bulky dive suits were used in early explorations of the 1915 wreck of the Lusitania. The ocean liner was sunk by a German U-boat off the southern coast of Ireland, killing 1,959 aboard and influencing the course of World War I.
Robert Ballard stands in front of the DSV Turtle research submarine (short for Diving Support Vehicle), on display in 1999 at the Mystic Aquarium in Mystic, Connecticut. The Turtle , retired in 1991 by the U.S. Navy, was a sister submarine to the DSV Alvin , which provided the first glimpses of the Titanic wreck site in 1985.
archaeologists, and engineers in the mid-1990s to retrieve 115 artifacts from eight ships sunk to the bottom of the Mediterranean Sea, including five ancient Roman ships. 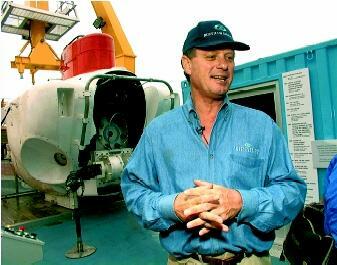 The expedition leader, oceanographer Robert Ballard of the Institute for Exploration in Mystic, Connecticut, first discovered one of the shipwrecks in 1988. Using the powerful sonar system of the U.S. Navy's NR-1 nuclear submarine, Ballard and his research team found three more of the wrecks in 1995 and four in 1997. Artifacts on and around the wrecks indicated that one Roman sailing ship dated from the late second or early first century B.C.E. , verifying it as one of the oldest Roman ships ever found. The shipwrecks also included four other Roman vessels from the first few centuries C . E ., and three ships from the eighteenth and nineteenth centuries. The wrecks, located west of Sicily in 762 meters (2,500 feet) of water, were the largest grouping of ancient ships ever found in deep water. The explorers believe that the five Roman ships sank in storms while following a high seas trade route between Rome and the ancient North African city of Carthage (located near the modern city of Tunis). This information corrected the previous archaeological belief that Roman ships followed coastal routes, rather than venturing out on the high seas. The research team recovered artifacts using the ROV Jason and a remotecontrolled arm on the submarine. Items retrieved from the oldest ship, which was about 30 meters (100 feet) long, included bronze vessels; at least eight types of pottery jars ("amphoras") for carrying and storing olive oil, preserved fruit, and wine; kitchen items; and two pieces of anchors. Ballard's team focused on mapping all the wrecks and retrieving selected artifacts from each ship. With this method, the researchers could widen their investigation and learn about all the ships, spending about the same amount of time and money as would have been involved in excavating only one wreck completely. Archaeologists say this strategy works well for deep-water wrecks that are likely to remain well preserved. Wrecks in shallow water, however, are subject to damage from looting, from coral overgrowth, and from being destroyed on reefs by waves and tides. Underwater archaeology uses special methods to study underwater archaeological sites, including shipwrecks. Archaeologists who work underwater rely on elaborate diving and excavating equipment and employ special techniques to preserve perishable materials that have been submerged for long periods. For instance, the Tudor warship Mary Rose (within Henry VIII's fleet) had to be carefully excavated from the Solent seabed off southern England after scientists discovered that it and its fascinating artifacts had been substantially preserved. Locals whose fishing nets get caught on underwater obstructions commonly locate sites. Divers searching for sponges have found many sites. Other sites are revealed through the dredging of rivers and harbors. Survey techniques that are used on land can also be applied underwater. Surveying underwater has been revolutionized by the use of GPS (Global Positioning Systems) in which receivers pick up signals from a set of satellites that regularly orbit the Earth; the satellites provide extremely precise location data for the sites. Poor visibility, large tides, cold weather, and problems associated with increased depths can make underwater excavation difficult. Because of these problems, expensive support ships are often anchored above the site. With the correct equipment, divers can work underwater for relatively long periods of time. Many excavation techniques used on land are adapted for use underwater. For instance, grids can be laid out to help in mapping the site and marking the location of objects, and to assist the divers as they excavate. Recording, drawing, mapping, and photography are performed with instruments that can be used underwater. Underwater video cameras are widely used in conjunction with computers for photographic surveying and three-dimensional (3-D) recording. This system is incorporated into GIS (Geographic Information Systems) that builds a static picture of the water landscape under study from a combination of photographs, maps, physical surveys, sites and monuments records, field surveys, and excavations. Various techniques are used to lift objects and sediments : air bags are used to raise baskets of objects, while air pipes suction up debris and sediments. Heavy objects weigh less underwater, and divers can sometimes lift them up to the ship. Post-excavation work begins on research ships and continues at land-based laboratories. Trained professionals conduct underwater archaeology with the use of lightweight scuba gear that provides divers with the maneuverability and independence to properly survey and excavate archaeological sites. Sites are first located using historical documents or local informers. Remote sensing devices, such as a proton magnetometer or an underwater camera, can then focus onto the site. Today's advanced instrumentation, improved access to data and documentation, and lightweight scuba gear gives underwater researchers the ability to pinpoint their dives and maneuver freely about an archaeological site. These divers, working on an eleventhcentury ship that sunk off the coast of Turkey, tag the artifacts before they are brought to the surface for examination and restoration. Excavation requires as much care in recording and removal as traditional field archaeology. In fact, more care is required with the additional hazards associated while working underwater. During the recovery process all recovered artifacts must be efficiently treated to slow down or stop deterioration as they are exposed to the air. Underwater excavation is important because of the knowledge that is gained from the investigations. For example, the study of shipwrecks shows how shipbuilding developed from small prehistoric dugout canoes to the large warships of the sixteenth century and later. Excavations of shipwrecks have also greatly increased the knowledge of maritime trade routes during the Bronze Age (the period over 3,500 years ago), and in later Greek, Roman, and medieval times. Organic materials such as leather, food, clothing, and wood, often are better preserved underwater and provide valuable information that is oftentimes lacking on most land sites. SEE ALSO Submarines and Submersibles . Ballard, Robert D., with Rick Archbold. Lost Liners. New York: Hyperion, 1998. McIntosh, Jane. The Practical Archaeologist: How We Know What We Know About the Past, 2nd ed. New York: Facts on File, Inc., 1999. Keiger, John. "The Underwater World of George Bass." Humanities and the Arts, Johns Hopkins Magazine. <http://www.jhu.edu/~jhumag/0497web/bass.html> . Underwater Archaeology. (translated from French to English) Department of Subaqueous and Underwater Archaeological Research of the Subdirectorate of Archaeology. <http://www.culture.fr/culture/archeosm/en/> . Vikdahl, Anders. What is Underwater Archaeology? Nordic Underwater Archaeology. <http://www.abc.se/~m10354/uwa/whatis.htm> . The tradition that a lost land of Atlantis once flourished has fascinated popular imagination. Some oceanographers theorize that Atlantis was once located in the Mediterranean Sea. Some predictions are based on archaeological discoveries from the Greek island Thera that experienced a gigantic volcanic eruption around 1640 B.C.E. Other theories are based on archaeological discoveries from the islands of Crete and Malta. The Ancient Mediterranean Research Association has conducted investigations in Spain and in the Mediterranean since 1972. This research suggests that a part of Atlantis, as described by Plato in the "Timaeus" and "Critias," is submerged under 60 meters (200 feet) of water near the Straits of Gibraltar. The small, rocky island of Malta has ancient structures that are dated c. 7000 B.C.E. , the world's oldest stone ruins. Malta shows evidence of having been destroyed in a cataclysmic Atlantic wave that filled the Mediterranean. The island is too small to be Atlantis, but data show that the Mediterranean was a different place thousands of years ago. The wrecks of the Titanic and the Empress of Ireland represent similar tragedies in different water environments. The Titanic sank in 1912 about 531 kilometers (350 miles) southeast of Newfoundland in the North Atlantic, killing 1,522. The wreck remained undiscovered until 1985; and in 1998, a large section of its outer hull was raised from a depth of 3,810 meters (nearly 2.4 miles). In 1914, the Canadian steamship Empress of Ireland sank in about 40 meters (130 feet) of water in the St. Lawrence River. The death toll was 1,012. Like the Titanic , the Empress of Ireland was "rediscovered" in the mid-1980s, but its story and underwater recovery efforts never achieved the Titanic's fame. Between 1989 and 1995, the Great Lakes Shipwreck Historical Society conducted three underwater expeditions to the 1975 wreck of the Edmund Fitzgerald, an ore carrier that sunk in Lake Superior. The ship's 200-pound bronze bell was recovered in 1995. A special underwater cutting torch was used to separate the bell from the roof of the pilothouse.